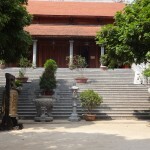 As we returned to the capital Hanoi, we visited the final centre on our adventure through Vietnam. 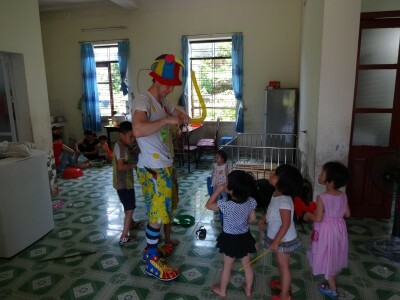 Whilst this orphanage provided a home for a number of children who would otherwise be without one, this centre presented a contrast with the other centres we had visited, and a candid reminder many children in Vietnam still require outside help. 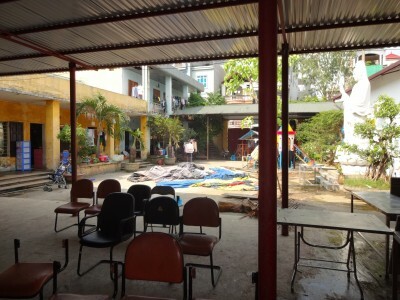 The Bo De Pagoda’s Orphanage centre was a small institution with a few bedrooms, a classroom, and an outside play area with some chairs and tables. In addition to providing a home for approximately 80-orphaned children, this centre also provided shelter for homeless people. There was a bedroom for homeless women, and a bedroom for homeless men. However the residents of this centre faced a number of problems, from what appeared to be caused by neglect and poor organisation. Many of these problems were a shock to myself and Sox. Several of the children at this centre had contracted skin conditions due to their carers practicing poor hygiene with them, and not teaching the children good hygiene practices. In addition to the poor hygiene practices at the centre, 30-40 children were being forced to live in rooms that were only big enough for a fraction of that number. The rooms were dirty and unmaintained too, and smelt from being overcrowded. Jack, a volunteer at the centre, showed us around the orphanage and explain some the centre’s issues that were letting the children down. He mentioned how he had caught some of the centre’s carers hitting the children, and security staff had been caught sexually abusing children too (a shocking contrast to some of dedicated mothers and staff we had met at previous centres). Some of the carers and homeless residents had been known to have stolen from the children too. Our guide explained how some of the centre’s children suffered from medical issue toos, which with some money could easily be treated, and would have already been so in many Western countries. For example one baby was suffering from cataract (a condition which impairs vision). However luckily for this baby, Jack and some friends back home in the UK, were in the process of raising the money to pay for the baby’s operation, so the problem could be corrected. Jack then took us to see where the people who were responsible for running this orphanage stayed. We walked around the corner, and then saw their accommodation. The accommodation was of good infrastructure, a modern design, and good, clean conditions. 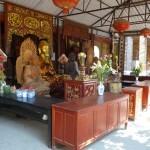 In addition there were gold statues and a safe full of financial donations from the centre’s visitors. There was also some construction going on, and a new building being built for the people who ran the orphanage (in addition to prodigious building that already stood). 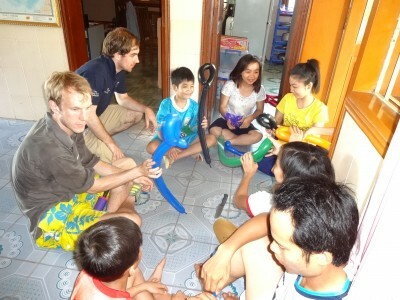 Out of the centres we had visited, this one definitely had the children living in the poorest conditions. This made it hard for me and Sox’s to accept, that just around the corner, others were living in such contrasting conditions (and these people were meant to be caring for the orphans here?). 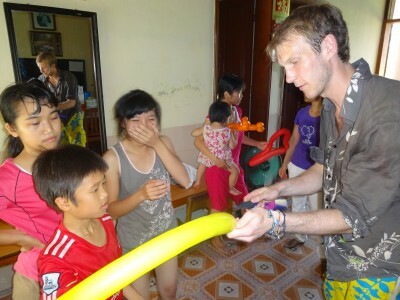 Luckily a charity called Projects Abroad had come in, to help the centre’s children. They were the ones who introduced the classroom for the children to learn and play in. They had also assigned a paid teacher to the centre, who was in the process of trying to reorganize it, to benefit the children. Jack was one of the volunteers’ from this charity, and he planned to stay at the centre for the next few months, trying to improve conditions at the centre. The charity, the teacher and the volenteers had already made a difference to this centre, although there was still of lot of work to be done. Without them, things would not be getting better at this centre. The children would continue to live in poor conditions and suffer abuse. However we still interacted with the children, played some games with them, helped them with some of their schoolwork and made some balloons with them! This centre definitely provided a contrast compared to other places we had visited. 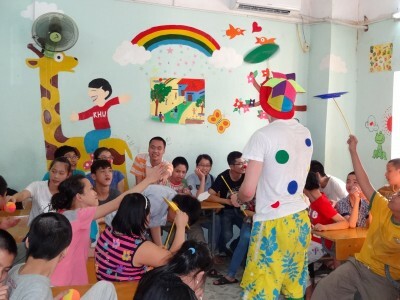 Compared to the efforts of centers like Peace Village, SOS Village and the Disabled Support School, to make a difference, this centre provided a reminder that not all Vietnese children are as lucky. Whilst a great number are very lucky to be cared for by such good centres, those who are in the care of less able or responsible centres, or have not been taken in by any centres at all, still need help. Luckily in this case, Projects Abroad has stepped in and is working to make a difference. 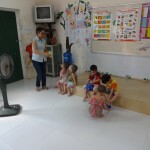 However there is still a great number of Vietnese children who require aid and support. 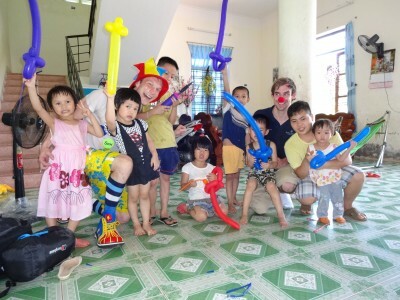 On this trip to Vietnam, we’d tried to make a difference to the children through clowning- through laughter and fun, and hopefully we had. It’s been a wonderful experience, and a privilege to meet these children, and visit centre’s and meet others who were making such a difference too. But it’s important to remember too, on top of all the positive experiences and memories, there is still a lot of work to be done in Vietnam. 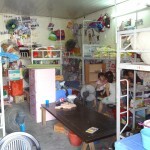 The fourth stop on our journey was a Disabled Children’s Support Facility in Hi Giang. Located in the very north of the country, it was a centre trying to do more to help the wider community. Trying to do ‘that little bit extra’. It was the smallest centre we had visited so far, providing support for thirty children. Many of these children suffered from learning difficulties and other disabilities such as blindness and deafness. Made up of a few classrooms, offices, a playground and a small medical centre, this school provided daycare for these children. It aimed to provide care for these children’s specific needs. 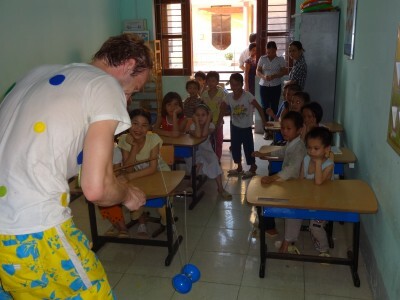 However on top of its responsibilities to the disabled children, the school also provided support for the orphans in Ha Giang. This additional commitment placed a strain on the centre’s resources. Having enough medical supplies to aid its students and the local orphans was an issue for the centre. However the centre was fortunate to have support from the local hospital. The doctors made frequent visits to the school, and brought medical supplies with them too. During their visit, the doctors would treat injured or ill orphans, and if necessary, they would take the children back to the hospital for treatment if they required more medical attention. Food supplies were also a concern for the centre as it tried to support local orphans. Outside providing for its own children, it would try to make a difference to the area’s homeless children too. For example on a six month basis, the centre would hold a meal for 120-200 children, finding them and bringing them back to the centre for a good meal. But the difference the centre could make was limited by its food store levels. To make a continuing difference, the centre was reliant on support from others. 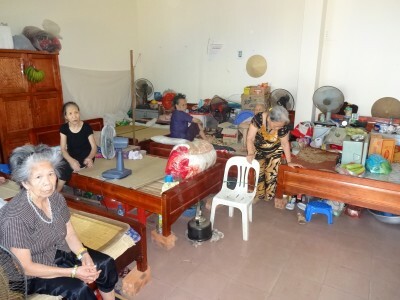 For example a monk from Hanoi had recently donated 400kg of rice to the centre. This had significantly boosted food supplies, and meant the centre could feed a large number of children for two weeks. The disabled centre also made efforts to try and house the area’s homeless children. 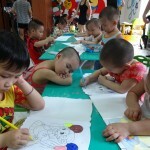 Through it’s connections with local families and other orphanages, it would attempt to find potential homes for orphans. 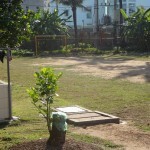 Then after potential homes had been set up, it would go out and find children to fill these spaces. After we had been introduced to the staff and introduced to the facility, it was time to get the clowning going! However as some of these children had hearing and seeing impairments, it meant Sox’s had to do ‘that little bit extra’ too, in his routine. From the moment Sox’s popped his a head around the corner in his brightly coloured hat and t-shirt, he emphasized all of his actions. He used his actions to communicate the emotions in his act, as well as sounds. 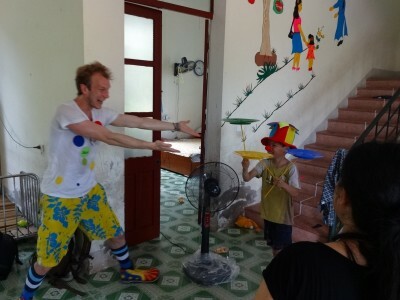 With a combinations of actions and tricks (spinning plates, balloon making and diabolo-balancing), he put on a show visually, to ensure the children with hearing difficulties were entertained. Click here to see Sox’s putting on a show! In addition to putting on a show visually, Sox’s created some excitement for the children using audience participation. For the children whose hearing was impair, they had the opportunity to get involved themselves, and see their friends get involved. Click to here to see the audience getting involved in the act! For the children who had poor eyesight, audience participation meant the children had the opportunity to touch, feel and use the props. One-on-one interaction from Sox’s meant these children could get involved too. 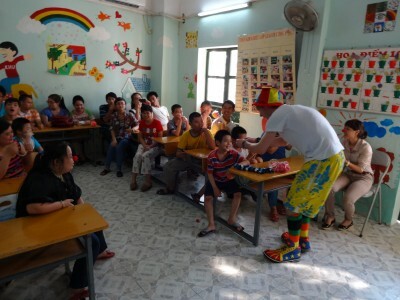 Throughout his act, Sox put his ‘clown sounds’ (see videos above) to good use to convey emotions, as Sox’s tried to engage the children whose vision was not as good. By using sounds as well (even if it was just the simple sound made by the air rushing out of a balloon), Sox’s tried to take advantage of all the senses, as he tried to make all the children feel involved, laugh and have fun. Sox’s tried to do a little bit extra in this centre by being conscious of each of the children’s individual needs. This helped all the children to feel involved. 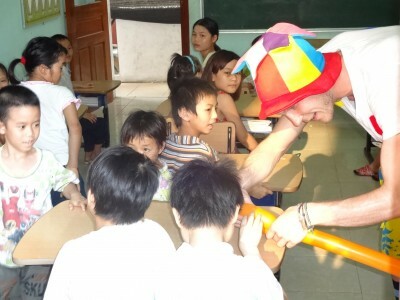 It required a little bit of effort and thinking, but made a big difference to some of these children. Likewise this faculty was a centre trying to do ‘that little bit extra’. Trying to do more than just care for it’s own children, and provide support to local homeless children. Even though it required a little help to do this, the centre was trying its best to make that extra difference too. It just goes to show how much ‘that little bit extra’ effort can make. Whether it’s an organization trying to donate a significant resource, or one person simply making some time and effort with an individual, it can go a long way to making a difference. Anything extra can make a huge difference to someone else, especially those in need. No matter the scale, it’s ‘that little bit extra’, which can make the big difference to others. Hiaphong was the next destination on our travels through Vietnam. 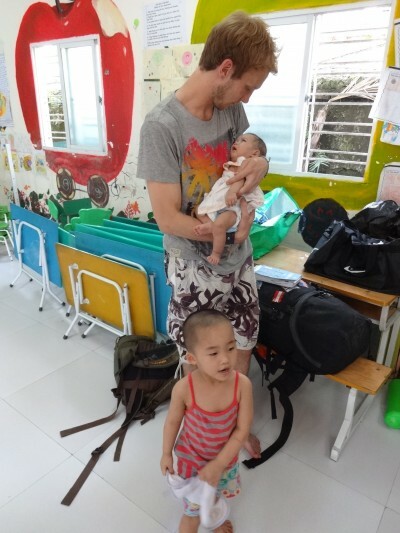 Staying at a local hotel near the city’s centre, we took a short motorbike ride to the second destination on Xain’s schedule: Hoa Phuong Orphanage. Little did I know, my experience at this centre would leave a lasting impression. Once again, we worked through the language barrier, and introduced ourselves, and what we were there to do. We were given an introduction to the centre and some background on the city. I was shocked to learn only 1 in 3 of the city’s orphans would be taken in by an orphanage. Of the estimated 2000 orphans in the area, 1300 children would remain homeless. They would not grow up in a supportive home environment. 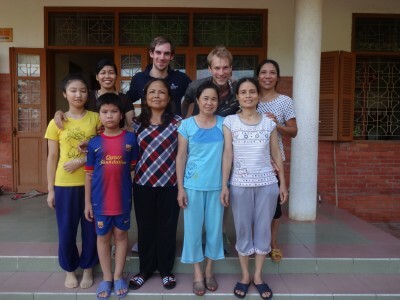 The centre we visited had ten houses, each accommodating seven children and a mother to care for them. Two or three children would share a bedroom, and ‘mum’ would share with the youngest child, so she could care for them at night. The houses were in close proximity to each other, which I imagined created a strong sense of community at this centre, as all the children seemed to know each other and be friends. 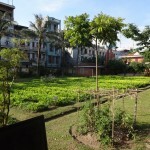 There was a large garden area too, for the children to play outside in. So introductions were done. It was show time again for Sox’s and myself. It was time to make a little fun and laughter happen! We gave out some red noses to the children. 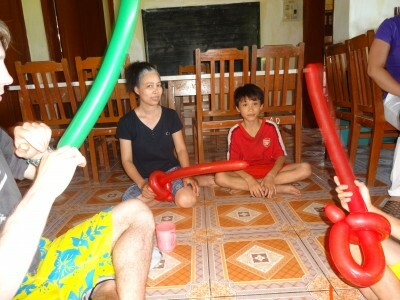 Then we made various balloons for the children including flowers, dogs and swords. Again we got the children involved, so we weren’t the only one’s spinning plates and performing the tricks! The children even challenged me to a balloon sword fight, which ended in my swift defeat (I was outnumbered to say the least!). Sox’s then lined the children up to throw balls at me, and see if they could throw them and get them to stick to the velcro helmet I was wearing! Challenge accepted- the children were determined to succeed, even if it meant throwing the balls at me again….and again……and again!!! After the show, some of the children offered to give us a tour of the centre, and take us round to the houses to visit the families. We didn’t even need to ask, they volunteered without asking for anything in return. As we arrived in each house, we were welcomed by the children of that house, offered a place to sit, a drink, and they even turned the fans on for us! The hospitality, kindness and spirit of these children was amazing. They may not have some of the luxuries we take for granted (Ipads, internet, brands etc), and may have had difficult beginnings, and faced challenges growing up in Vietnam, but this didn’t stop them showing us all the positive elements of human nature. How welcoming, positive and kind these children were, really did impress me, and they didn’t ask for anything in return. Visiting this orphanage definitely was an eye opener. 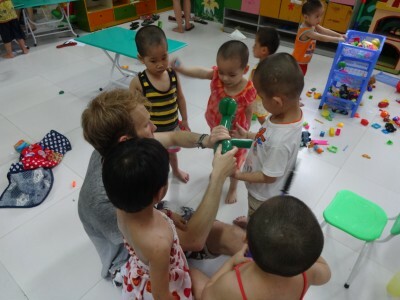 First the realisation that the majority of orphans in the Haiphong area wouldn’t be lucky enough to grow up in loving, stable, family environment. In the West, we often take this for granted. Secondly, the inspirational positive attitude and character of these children- they gave without expecting anything in return, and regardless of what they hadn’t had in life. These children really were inspirational, because they reminded me, even though life had seemed to deal them less, they showed all the good qualities of human nature. So what did I take away from this orphanage? On top of an amazing experience and the opportunity to meet some amazing children? Just a little perspective. Of how lucky I am, and how thankful I should be. And how it’s important, even when things do seem to go wrong, to maintain some perspective. The Clown Effect: It’s Universal! 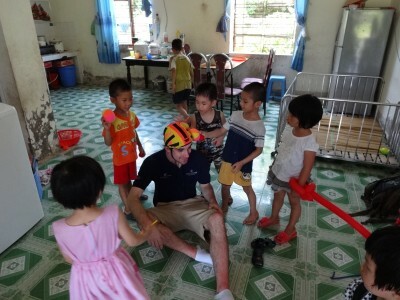 And so it was the first day on our planned schedule of visiting various orphanages in the North of Vietnam. First stop on our route: Peace Village. 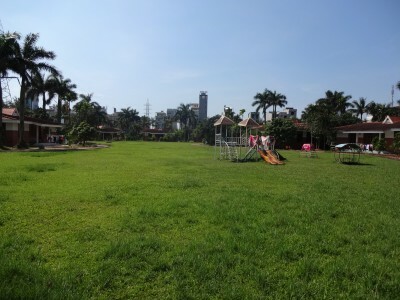 Located within the country’s capital Hanoi, Peace Village was a large, well developed centre with a spacious playground and well constructed classrooms and teaching facilities. 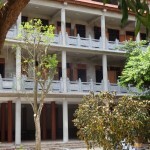 It provided a home to many orphans from the city, and school facilities for a number of children who have been lucky enough to have been raised by their own families. Founded in the 1920’s, the centre catered for children with learning difficulties, and provided access to therapies designed to benefit the children’s development (such as hydro & electro therapies). 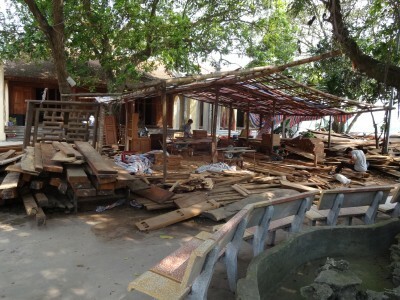 The organisation is lead by Miss Phong, who has a number of teachers, assistant teachers and grounds staff, who work together to make Peace Village a success, benefitting the children. Sox’s and myself were instantly greeted with open arms when we arrived, and made to feel very welcome (showing us why Vietnamese hospitality is rated so highly!). Greeted at the gate, we were then introduced to Miss Phong, who took us to her office, where she offered us some refreshments and provided some background on the centre. As the conversation continued, we realised explaining what clowning is, when you don’t speak the same language, isn’t exactly easy! Rapidly we looked through the phrase book picking out various words, and using different props (eg. 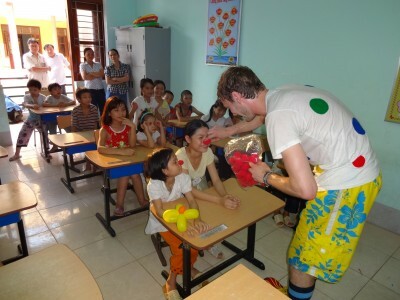 clown noses etc), we tried to explain what we were there to do- entertain and make the children laugh! Once introductions were complete, we were given a tour of the facility, and then it was showtime! 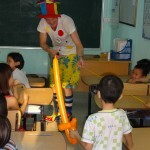 Time to make the children laugh, and spread a little fun and joy! But some of the unanticipated difficulties in explaining who we were and what we were doing at the orphanage, made me slightly concerned. 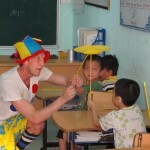 Would the jokes and tricks work with such a language barrier, if the children didn’t understand us? Would it work with such differences in culture? …And then Sox’s appeared! Dressed in a multicolored hat, massive red clown shoes and a spotty t-shirt. A smile spread across the children’s faces, and then as Sox spoke in his high-pitched ‘clown nosies’ and started falling all over the place, and bumping into things, the smiles turned into laughter. Next came the various tricks: Balloons, juggling, spinning plates and the Diablo. Then the children’s laughter turned to silence for a second, as Sox’s got some of the children involved; spinning the plates for themselves, and getting them in on the act. There was even more laughter with audience participation, as well as a very happy teacher, to see her class having such a good time. Seeing Sox’s in action, I then realized that speaking the same language as the children really didn’t matter. And it wasn’t just because Sox’s used ‘clown noises’ as opposed to words, that the performance worked. A clown’s act will often be combination of tricks and routines. 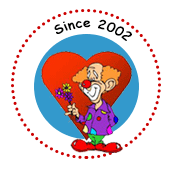 But the most important element is the clown themselves epitomizes happiness, and through their act, is able to spread that happiness to audience (a bit like how infectious a smile is……when you smile at someone, it’s hard for them not to smile back…..definitely worth a try sometime!). Happiness is universal to us all, and that’s what a clown is able to tap into, using their happiness, which goes beyond any difference in language and culture. 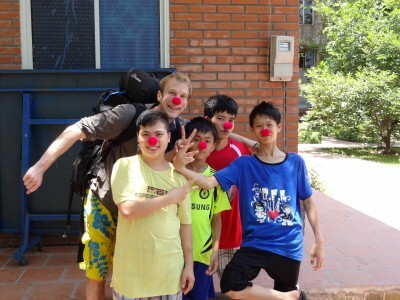 That’s why clowning is so powerful, and can work across different cultures. That’s what I didn’t realise until then, my first clown experience. And that’s why our first day was such a success. Because Andy became Sox’s, and was able to spread Sox’s happiness to the children, irrespective of the language barrier we shared. Through his act, he bought some happiness to these children. It was all down to…….the Clown Effect. A train journey, two plane journeys, and a taxi ride on the capital’s manic streets, and we’ve made it to our first stop in Vietnam- Hanoi! One crazy fast paced city, with lots going on, and definatley unique from anywhere I’ve been in the world. 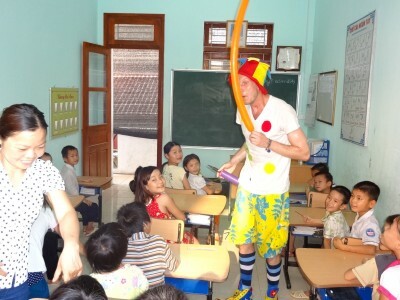 I’ll be travelling around the country of Vietnam over the next few days with Sox (aka Andy Bownds)- an experienced traveller, who’s been to many places already all over the world, and also an experienced clown. 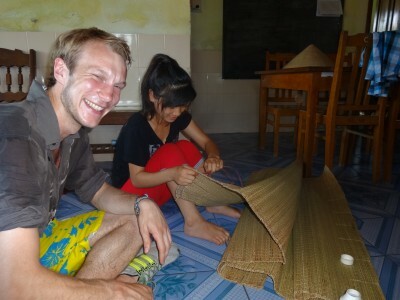 He took part in the trip to Peru in 2011, and is going to be using some of the skills he acquired there, to spread some happiness in Vietnam. 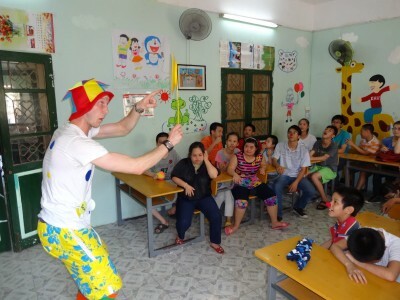 Me myself, I’m pretty new to the travelling thing, but loving it already, and can’t wait to get involved with the clowning, and spreading a little joy to the communities we meet in Vietnam. I’ll be keeping you updated on our travels on here too! Plan over the next few days includes: visit an orphanage known as Peace Village in Hanoi, before a boat trip to Ha Long Bay and then on to the Phillis Hope Orphanage. 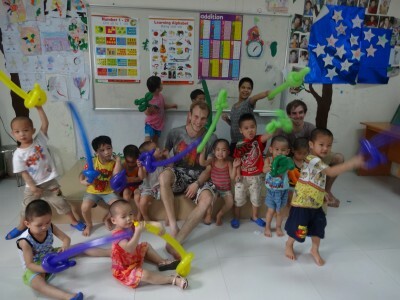 Then on our busy schedule we’ll be visiting a handicapped childrens centre in Ha Giang. And there’s more to come after that. I’ll be keeping you informed each step of the way via this blog, about the orphanages and schools we visit. Much more to come! Will be blogging again soon, so keep following our adventures! Ps. A massssivvve thank you to Xain (Sure Sure) for helping arrange our busy schedule over the next few days, and introducing us to a lot of different communities in Vietnam. Pss. Also a big biiiigg thank you to Duffy and Mellisa at CCI, for helping us to get started organising this trip, and making this blog possible too! Me and Sox really appreciate the support while we’re doing our thing here!